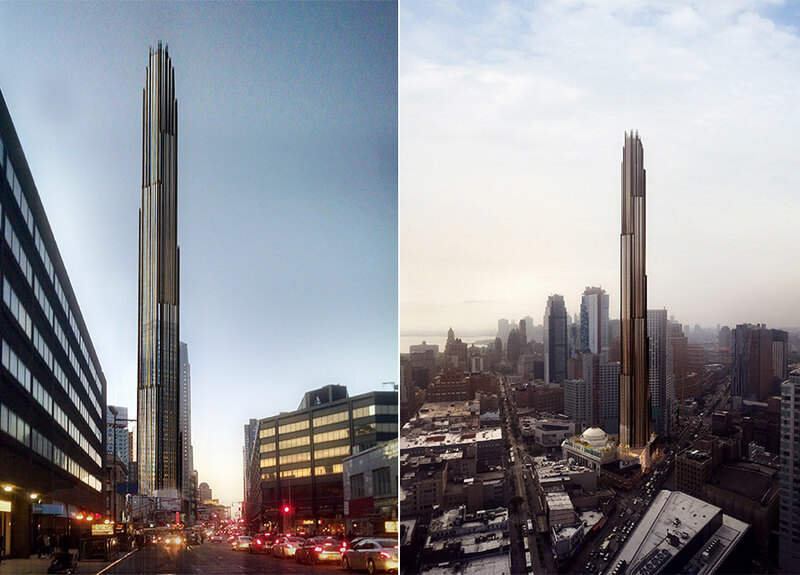 Brooklyn is finally getting a new skyscraper development worthy of its 2.6 million populace. 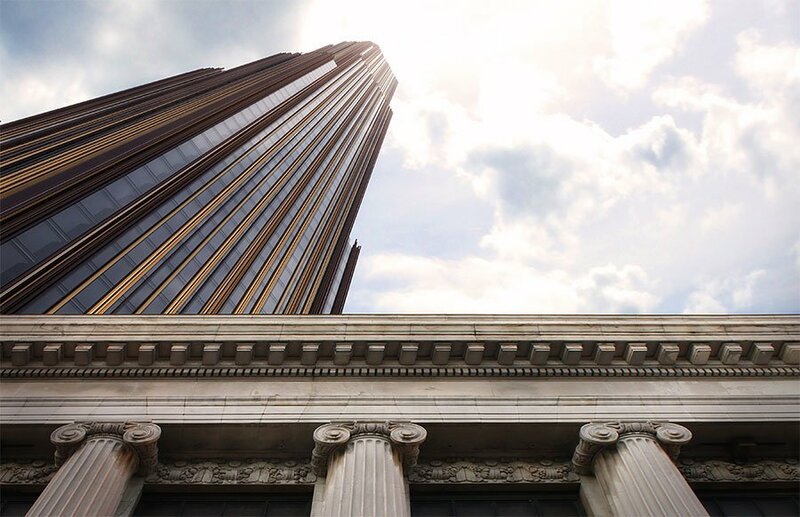 Today, the Landmarks Preservation Commission approved SHoP Architects‘ vision for 9 DeKalb Avenue, a rehabilitation of the landmarked Dime Saving Bank that will marry it with a dramatic, supertall skyscraper behind, the first 1,000+ foot building to arrive in the borough. 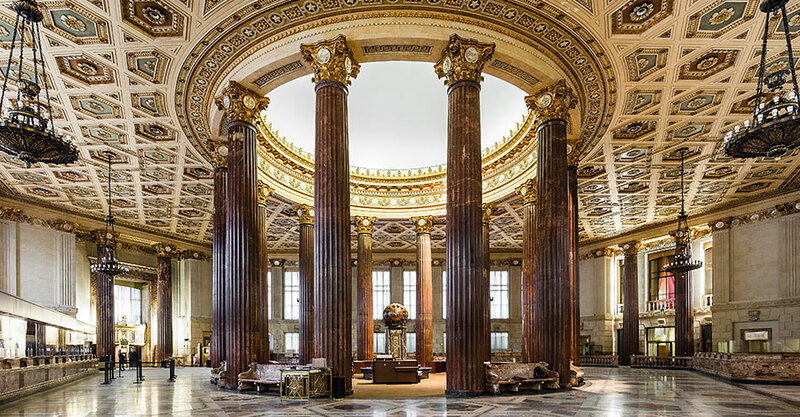 The Beaux-Arts banking hall, which is both an interior and exterior landmark, hosted a J.P. Morgan Chase branch up until last year. 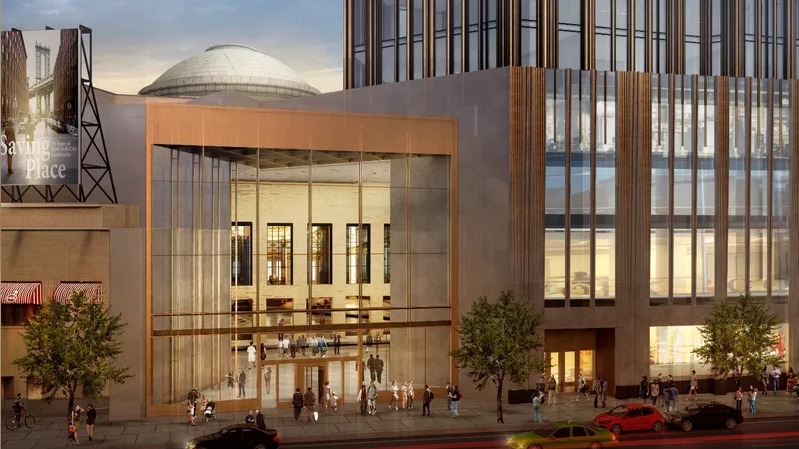 Now, its new owners, Michael Stern’s JDS Development and the Chetrit Group, plan to transform the hall into a public and retail space that will complement their new tower. 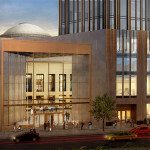 To bring back more of the building’s grandeur, its exterior and interior spaces will be restored, and to accommodate the tower behind, the team is calling for the demolition of two nondescript one- and five-story rear annexes, which will then allow for a grand entrance to the skyscraper and a public through-space. 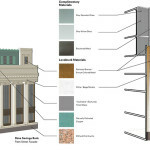 The LPC was enamored with the project, calling it “flawless” and “enlightened urbanism at its best,” as well as touting that it “improved the vision of this historic landmark.” One commissioner even went so far as to say “It’s similar to the Parthenon sitting on the Acropolis.” The LPC had only a few minor modifications, the most notable being that the teller cages be retained until the team can show a plan detailing how the retail tenant (there will only be one) will use the space. 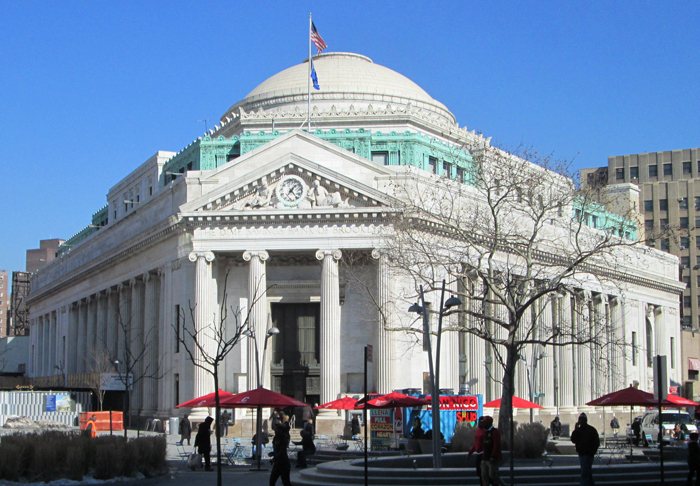 The Dime Savings Bank is among the borough’s greatest architectural icons, boasting a timeless Classical Revival marble exterior with a classical entablature and pediment, resting on stately rows of Ionic columns. 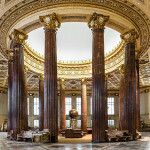 It was first finished in 1908 under the architects Mowbray & Uffinger and then greatly expanded in 1932 under Halsey, McCormack & Helmer, who are responsible for the interior’s large gilded Mercury-head dimes and 12 red marble columns supporting the rotunda. 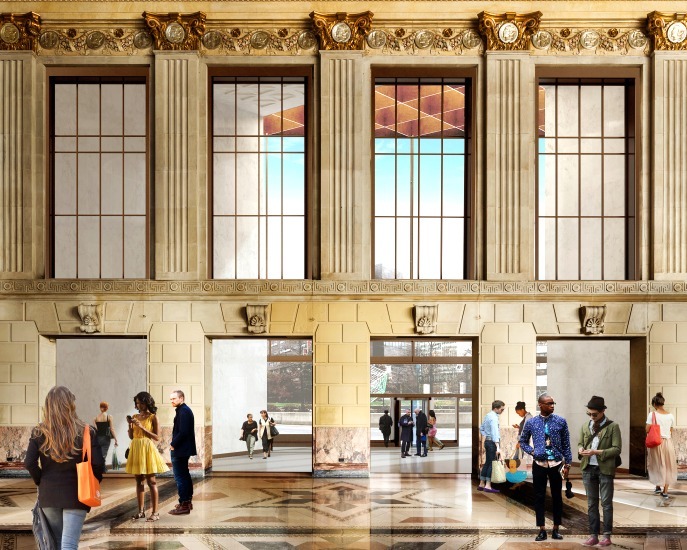 In addition to possibly reconfiguring the teller stations, interior work includes restoration of the rotunda and original Terrazzo marble flooring, replacement of modern flooring with marble flooring, and the addition of double-pane clear glazing at the bank windows. 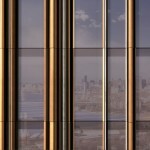 Set to soar 73 stories and 1,066 feet tall, the tower’s shape uses interlocking hexagons that are inspired by the footprint of the bank and respond to the site’s triangular shape. 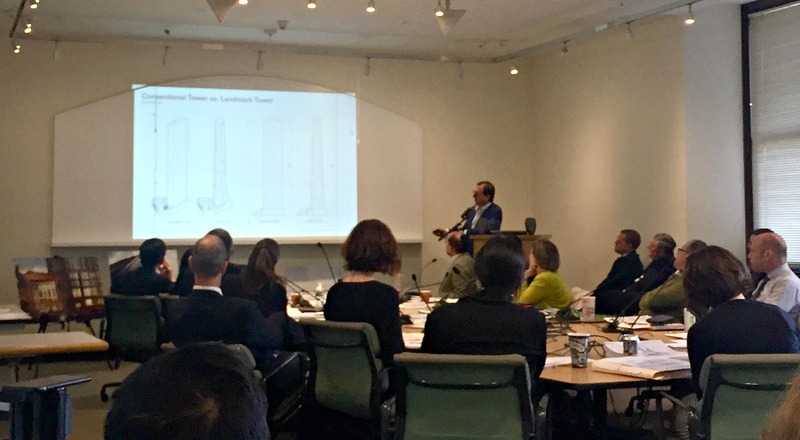 During the presentation, Gregg Pasquarelli of SHoP Architects noted that they didn’t want to build another slab tower like those on the rise nearby. 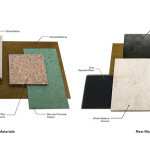 As such, the facade articulation and the materials used are meant to give the building more texture, especially as it is viewed from different vantages across the city. 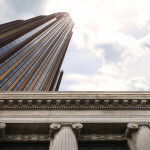 Echoing the fluted columns of the bank’s exterior, the tower’s glass facade will be overlaid in ribbons of bronze, stainless steel, and black granite. Inside will be roughly 500 rental units, a mix of high-end apartments and 20 percent below-market rate housing. 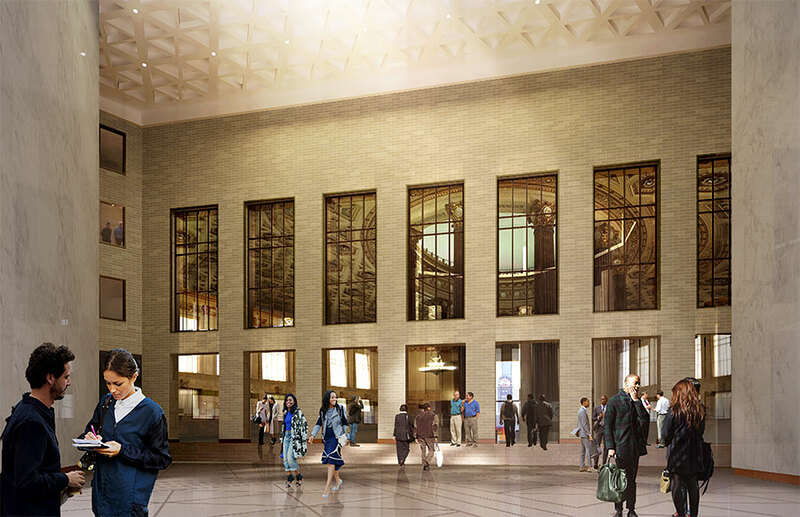 During the LPC presentation, Pasquarelli noted that the new atrium will open up views to the bank off Flatbush Avenue, something that currently does not exist. The overall goal of the plan is to improve the landmark’s visibility from all surrounding streets while also optimizing light. 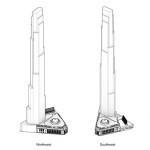 The presentation materials also show how if a 20-story as-of-right tower were to rise on the adjacent site of Junior’s Restaurant, the atrium would provide a visual break and prevent the two edifices from creating a massive wall. 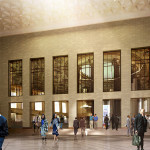 According to one LPC Commissioner, the reasons the project is successful are: 1) the restoration and adaptive reuse 2) the massing of the building and site planning and how it molds and shifts to nod at the primacy of the landmark and 3) the design itself, which is sensitive to materials, quality, and urban context. “It creates a spiral and a beautiful piece of architecture to mark an important node,” she said. If all goes as planned, the project will finish sometime in 2019. 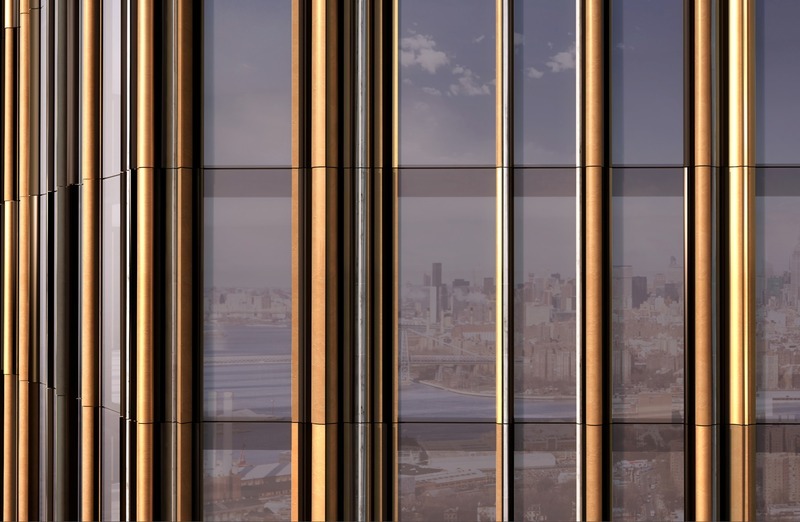 Stay up-to-date on leasing and listings for 9 DeKalb Avenue Extension over at CityRealty. And view the team’s entire LPC presentation in PDF form here. The behavior of the LPC here is the very definition of an arbitrary, irrational, and capricious. It is breathtaking in its Orwellian horror. 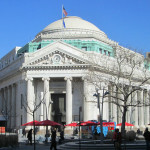 The most important thing is that the Dime Savings Bank, which is a Brooklyn treasure, be accessible to the public. I think the bank teller windows should be left up no matter what the retail use. 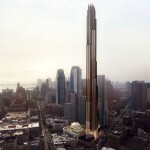 The attached apartment building is scarily huge and will put pressure on the already overcrowded subways into the city. The city’s old infrastructure can’t keep up with such huge buildings. 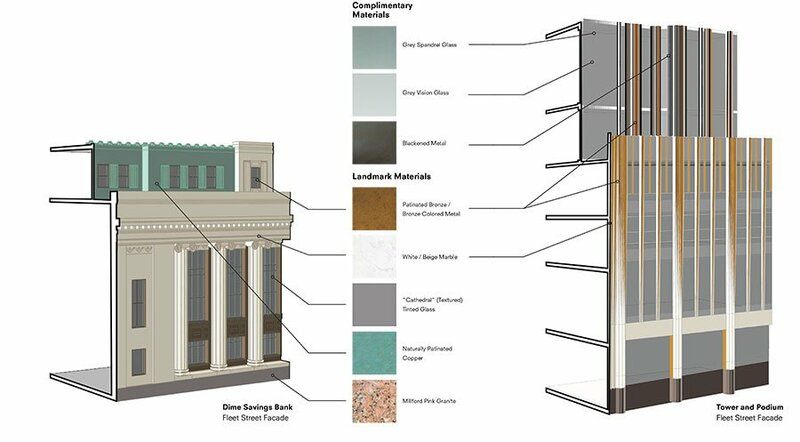 The Dime Savings Bank is a beautiful structure, but I agree with the standpoint that SHoP is taking: it’s not showcased. Albee Square set back from Fulton and the structure sort of fades into the background. Fact of the matter is they (JDS, Chetrit, etc) can build the ugliest effing condo/apartment tower here as of right, but they’re choosing to use this as an opportunity to elevate both old and new architecture in the area. 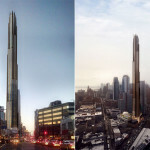 Some of the other towers that have gone up recently around BAM are completely soulless and lack any design character. 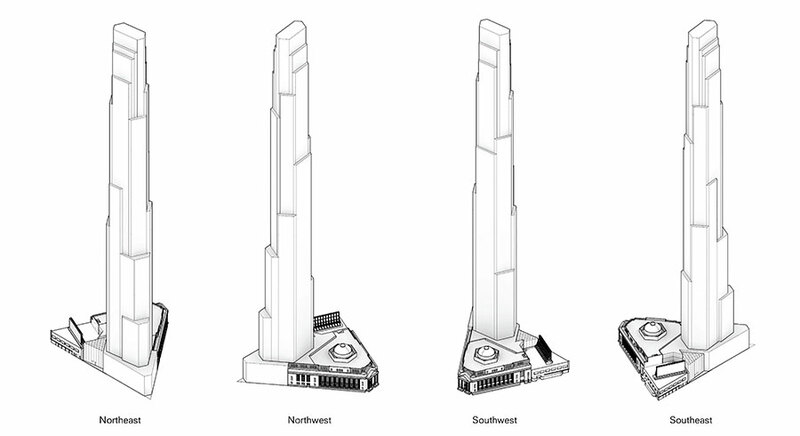 Assuming they deliver to the quality of what’s rendered, downtown is finally getting a tower of One Hanson caliber.